Kingspan KoolDuct System ... high quality. The product is listed as a Class One air duct, to standard for safety UL 181 (Underwriters Laboratories standard for factory-made air ducts and air connectors), when fabricated to a specification clearly defined by UL, which is a stipulation of the Smacna PDCS. “Well recognised as a premium choice for insulated ductwork, Kingspan KoolDuct System will aid in high quality fabrication,” says a spokesman for the company. He adds Kingspan KoolDuct panels, used in the fabrication of the Kingspan KoolDuct System, feature a premium performance fibre-free insulation core, which has zero ozone-depletion potential (ODP) and low global warming potential (GWP). Ductwork fabricated from the Kingspan KoolDuct System can achieve air–leakage rates far lower what is typical of sheet metal ductwork, he states. “Independent research has shown that the system can provide impressive lifelong cost savings of 25 per cent when compared with an equivalent galvanised sheet metal ductwork specification,” the spokesman adds. 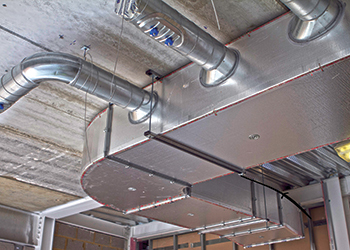 The Kingspan KoolDuct System can also be used to fabricate ductwork which is much lighter than traditional alternatives, allowing fast-track installations and reducing its hazard potential. This can help minimise risk assessments, safety strategies and protection measures. Smacna is an international trade association focusing on quality and excellence in the sheet metal and air-conditioning industry. Its standards and materials address all aspects of the sheet metal industry, from duct construction and installation to air pollution. The PDCS provides detailed information and guidance on all aspects of pre-insulated phenolic ductwork fabrication. Kingspan Insulation has a vast product range suitable for a variety of applications in the domestic, non-domestic, new-build and refurbishment sectors. Its products divide into four categories: insulation boards for roofs, walls and floors; HVAC (heating, ventilation and air-conditioning) ductwork insulation and pre-insulated ductwork systems; pipe insulation; and engineered timber systems.